The resort is roughly a 10-minute drive from Phromthep Cape - a famous landmark of Phuket and a great spot to view a spectacular sunset. Situated on the beachfront, the resort itself offers beautiful vistas of the sunrise. Guests can also stroll along the pine trees lining the beach, where fishing boats are berthed, and observe the locals' daily life.Guest rooms are meticulously decorated with colourful furniture for a cosy ambience. 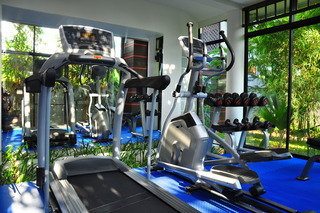 With full amenities, the rooms have either a swimming pool view or a refreshing green garden view. The hotel offer restaurant and bar for serve food and beverage for guests enjoy. 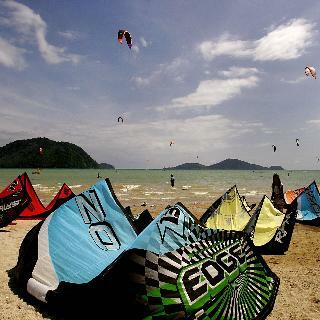 And also offers airport transfer services [Phuket International Airport (HKT)] at an additional charge. Guests are kindly requested to inform the property in advance if they wish to make use of this service. This stylish all villa-style resort is set within extensive tropical gardens leading down to Friendship Beach with stunning views across Chalong Bay. Located on Phuket's less developed and tranquil south east coast the resort is 45 minutes drive from the airport and just 15 minutes from Phuket town. The detached villas are scattered among the gardens and include 72 Deluxe Villas measuring a generous 72 square meters complete with separate dressing area, large bathroom with outdoor rain shower and private terrace with sunbeds. All villas come equipped with king-size bed, air-conditioning, minibar, tea & coffee making facilities, IDD telephone, high speed Internet access, safety deposit box, flat screen TV with satellite and DVD player. 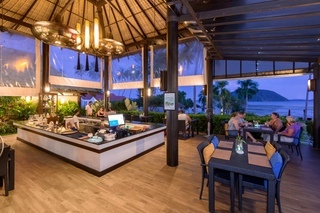 Offering a choice of 2 restaurants and 2 bars the resort prides itself on its food quality using organic produce; guests can choose to dine at Baan Vijitt a Portuguese style house serving authentic Thai cuisine or The Savory offering a choice of cuisines close to the beachfront. Resort facilities include a large infinity edged lap pool overlooking the beach, the V Spa offering an extensive range of treatments and a large Kids Club. Welcome to Saturdays Residence-Sleep Less Dream More inspire your long stay holidayWelcome to your tropical island retreat with views of the Andaman Sea from classic New York Bay apartment-style residences in Saiyuan on the south coast of Phuket in sunny southern Thailand. Stay at Saturdays and ease into a lifestyle of contemporary comfort and convenience designed to inspire your long stay holiday.Saturdays Residence offers modern and spacious suites, along with an outdoor swimming pool. 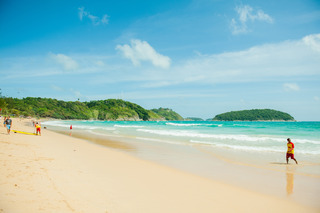 Free WiFi is available.It is a 10-minute drive from Nai Harn Beach and the Rawai Beach area. Restaurants and shops can be found nearby. Phuket International Airport is a 43 km drive away.Offering 1-bedroom and 2-bedroom suites, accomodation comes with air-conditioning, a balcony and an en suite bathroom. The living area includes a flat-screen TV, a dining table and a small kitchen. 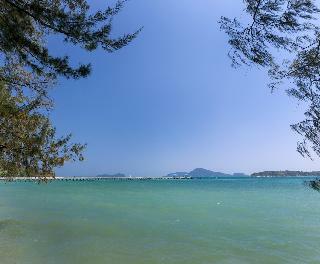 This hotel has a wonderful location on the serene Chalong Bay beachfront. A range of local shopping and dining is within easy reach in Rawai and Chalong Just a short drive away. The hotel is only 15 minutes from international standard hospitals, world class restaurants, shopping centres and Phuket Town. The hotel has a lobby with 24-hour reception, hotel safe, currency exchange, lift access and hairdressing salon, a spa, a games room, internet access, café, bar, restaurant, breakfast room and dining room. Kok Yang Estate located in southern Phuket in the beautiful village of Nai Harn is increasingly one of the islands more popular destinations to visit. Tropiclook maintain constant satisfaction that we can continuously deliver the highest of service standards for all of our guests creating unforgettable returnable stays.Each villa provides modern stylish interior and furnishings each fitted with air conditioning. Here in your own private paradise you're wrapped in tranquillity. Each villa is surrounded with large tropical lush gardens and private swimming pools. There are plenty of places to sit and chat, read a book or just appreciate your superb surroundings. Each villa has a spacious open plan living, dining and fully equipped kitchen for all your necessary living desires. All bedrooms include a bed fit for a king, ultra-luxurious en-suite bathrooms complimented with a bathtub for deep relaxation after a long day of sun and fun.We provide for the convenience of our guests complimentary wi-fi, cable TV and free shaded parking for cars and motorbikes. If you can bear to tear yourself away from these incredibly charming homes for a day there are many local attractions and sites to be seen. Despite feeling like you're in your own private paradise, a world away from civilisation you are in fact just a short walk or drive from everything you need such as restaurants, shops, spa salons with excellent Thai massage, Phuket Seashell Museum, Phuket Aquarium, the most photographed viewpoint Laem Phromthep and sports facilities, as well as Nai Harn Lake. 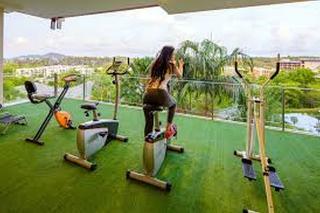 The park area is equipped with outdoor fitness equipment which is popular amongst residents and visitors of the island who lead an energetic lifestyle. 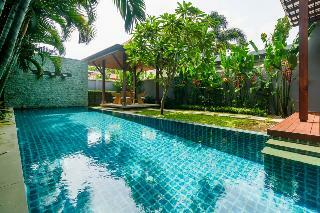 Contemporary and luxurious pool villas complex overlooking Rawai bay. Located in a private and quiet area of Rawai, South of Phuket.The villas are designed to create a combination of western technology and tropical Asian styling. Generous outdoor living areas with overflow pool and a manicured tropical garden will make you relax in a seamless indoor/outdoor living lifestyle.The complex offers two large 6 bedrooms pool Villas with stunning views of Rawai Bay, five 4 bedrooms pool Villas with an open view on the bay, and four 3 bedrooms pool Villas very private with a large outdoor living space, all offering full privacy to our guests.The Villas are tastefully furnished with all the comfort you could expect (central power generator, LCD TVs, Daikin ducted air conditioning in all rooms, Complimentary satellite channels, High Speed Wi-Fi, equipped kitchen, J.B.L Home theater…). Offering a secluded beach area and 23 villas in Rawai, Fisherman Way Beach Villa is situated in a charming residential estate surrounded by mature parkland home to deer, swans, geese, and many bird species, a true nature's hideaway. Villas are individual in style and location offering guests kitchens, dining areas, and living rooms. Choose from comfortable one bedroom cottages, cozy two bedroom villas, spacious three bedroom villas, and luxurious nine bedroom villa. 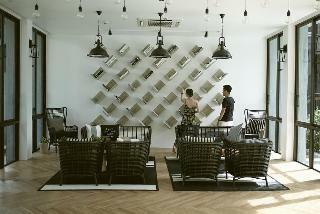 The highlights are beachfront pool villas with panoramic views of the Andaman Sea and surrounding islands. Other cottages and villas are dotted throughout well-manicured verdant gardens with decorative lakes. A selection of restaurants and conveniences are available within an easy stroll just next door at Fisherman Way Business Garden. The Jasmine Nai Harn Beach Resort and Spa,Phuket ThailandOur unique boutique resort is tucked away in a great relish of Jasmine fragrance in south Phuket, offers an escape from everyday life to rejuvenate and unwind in beautiful tropical surroundings with a retreat intimate atmosphere of Jasmine scent, a contemporary resort in the vicinity of tranquil Nai Harn beach, overlooking lush rainforests and mountains where the fresh air is being inhalation into your home away stay.All livable studio rooms equipped with modern facilities, an infinity-edge swimming pool, a fitness , spa treatment, business center, on site restaurant, which is located on a serene of Rawai ,just 10 minutes to Nai Harn Beach, and Promthep Cape, just 50 minutes from Phuket International Airport, a walking distance to convenient store,10-15 to the nightclubs, bars, restaurants and shops.Retreat your stay! !